So here are some videos in which four members of the international Governing Board of SIPRI answer those questions. Two of them are mainstream international relations scholars, one British, one Russian. One, the head of the Board, is a Swedish diplomat not known for his independent thinking – as also comes through here. He blames Russia for all Europe’s problems, for not accepting a rule-based international order and changing borders (as if it were the only one!) and believes that withdrawal from Crimea is the first step towards preventing a new cold war and that “the whole world has to say No to Georgia’s being divided by Russian aggression. See, now you understand it all much better! The fourth is a German diplomat who is related to finance management and chairs the highly mainstream, militarist Munich Conference on Security Policy. He has recently argued, in diplomatic terms of course, that dictator al-Assad should have been removed earlier, that Russia should have been countered by a Western intervention in Syria and that we must save both “pax americana” and the liberal international order. See, a true peace-thinker! None of the four board members have a background in academic peace research. • Do they talk in reasonably sharp intellectual terms? No! It’s mainly some small-talk political commentary with no originality or theory. No perspective of history or of what the future may bring. • Do they have any new and sparkling ideas about how to make peace? No! Except what they in their narrow “school of thought” believe can be done by military means and by governments. None of them seem to have a concept of peace on which to base their words and more or less lofty personal wishes for the future: “I would like to see that..” which has also nothing to do with research. • Is this anything but traditional international relations, geopolitical-military or political science commentary in what they say? No! They share a government perspectives, no civil society aspects, no linking to democracy or identification of things that should be researched more. No re-searching mind. All seem quite tired if not re-tired. • Does it have anything to do with peace research? No! Words like conflict-resolution, nonviolence, peace-making, reconciliation, dialogue etc. don’t seem to be on their radar. The only thing in common seems to be the Russian, German and British voice advocating joint projects and a strengthening of the OSCE. The EU is mentioned once: that it should put peacekeeping troops on the ground in Aleppo (!). And the UN? The UN, the global movement for disarmament and security, the changing world order, development issues – not a word! Also not a word about peace education or the possible role of media in providing both war reports and peace stories. My congratulations at the 50th Anniversary of SIPRI, this once so promising, innovative institution! I know it was promising because I interned at SIPRI on and off for weeks as a young student in the 1970s when it was at the Wennergren Center sky scraper – leadership sitting at the top floor, those doing newspaper clippings on the lower floors. I’ve written reviews of SIPRI’s amazing Yearbooks and many special studies, not the least in the Danish daily Politiken in the 1970s and 1980s. 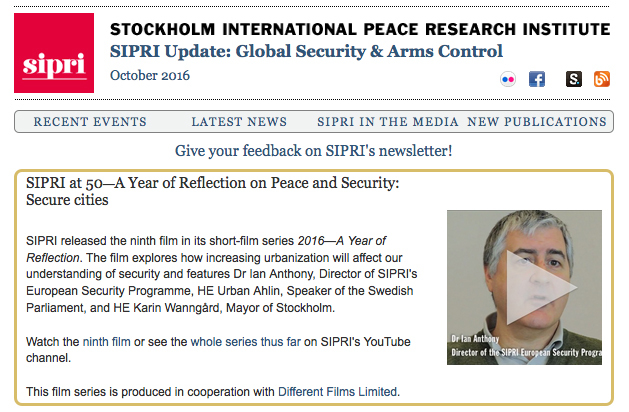 I got the greatest respect for the meticulous data collecting – “bean counting” – from only open sources that SIPRI is still very good at. (But that isn’t peace research). I vividly remember the seminars and the dynamic leadership of its scholar-director, amazing Frank Barnaby whose knowledge about nuclear weapons and nuclear policies and passion for nuclear abolition impressed everyone who met him and listened to his dark rusty voice. I silently wonder whether such a character would be invited to SIPRI today? Since its work has so conspicuously little to do with peace thinking and re-search into the vast and fascinating field called world peace, perhaps it’s time to change name to Stockholm International Military Security Institute, SIMSI?